We’re proud to have state-of-the-art facilities and all levels of classes that support your goals and well-being. Perfect for beginners and advanced practitioners alike. Within these classes you can make and adjust your own resistance. Classes range from 70˚-90˚. Good for beginners and advanced practitioners. Incorporates strength and cardio. Classes range from 90˚-98˚. Challenges your fitness level. Incorporates high cardio and optional weights. Classes are 90˚. Would you rather do yoga in a cold frigid environment or a warm comfortable room? Heating the studio allows your muscles to warm up and become more pliable as you move throughout your practice. We are not in the business of providing a room that feels overbearing and overwhelming. Our studio offers a healthy heat that is solely meant to enhance your practice. 90% of our clients who initially feel that they cannot do “Hot Yoga” find themselves coming back for more. We encourage you to have an open mind and give it a try! You will love it (we promise)! POP Pilates is a mixture of Pilates exercises with the attitude of choreographed dance and energy of pop music, a challenging workout that is both fun and effective! From one exercise to the next, you will build a rock-solid core and leave no muscle untouched. You’re free to modify each move to fit your personal needs. No previous Pilates or dance experience required — just bring your mat and a smile! Aerial arts and yoga combined. Try your yoga poses in a hammock while suspended off the ground. Using the hammock increases muscle tone, flexibility, and facilitates spinal decompression. Add more challenging poses to greater increase your range of motion and experience the benefits of full-body workout, without the stress on your joints. End each class by levitating and meditating while floating in the air wrapped in your own private hammock cocoon. Find your center. Breathe. Enjoy. This Barre Pilates practice produces sleek, dense muscles and helps burn excess body fat through a series of challenging movements, some held for several minutes. It is organized into bursts of ballet-based intense physical activity followed by short periods of deep stretching and recovery. Strengthen your core, increase your strength and improve your posture and muscle definition! Enhance your well-being in this workshop style practice with assistants. It focuses on alignment, modifications and goes at a slower pace for beginners of any age. Intermediate to advanced practitioners interested in refining alignment are also welcome. Expect healing and strengthening of your back and improved stress management and balance. Also expect renewed energy, strength & stamina. SILVER FIT is a fun interactive Pilates style class. It offers a full body workout and incorporates gentle movements, muscle toning and stretching. This is a class ideal for those who take the VINYASA SILVER and want a challenge. All levels welcome. VINYASA SILVER is a slow, senior focused vinyasa - Incorporating traditional breathing exercises along with gentle stretching to increase flexibility, core and back strength. Ideal for Increasing stability and balance. Slow and relaxing Yin Yoga - Focusing on asanas that are held for longer periods of time. This TrueRoots Yin class is great for beginners to learn foundational yoga poses and is also a great class for experienced practitioners to deepen their practice. This class is approx. 60 - 75 minutes with relaxing and calming music. 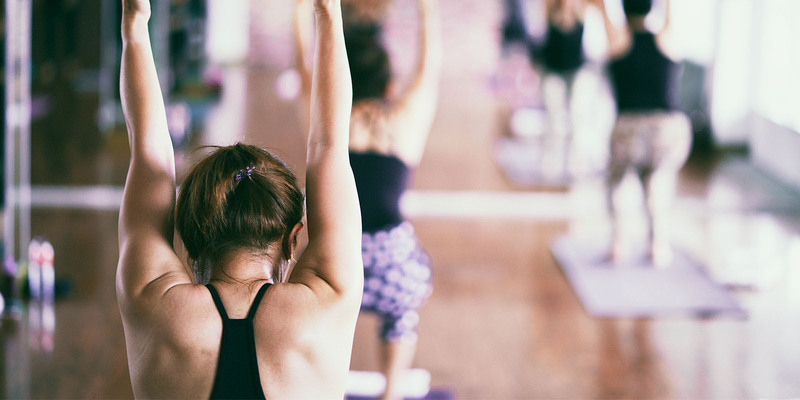 VINYASA CORE is an upbeat and fun, forty-five minute, beginner-friendly class that will help you build a strong core while integrating strength conditioning and yoga flows that work together to help you reach your ultimate fitness and yoga goals. This class begins with 8 minutes of cardio, followed by 12 minutes of abdominal exercises, topped with strength conditioning and vinyasa flows for a fun workout that delivers fast results! WOMEN ONLY! BUTI is a workout that combines elements from yoga, tribal dance and plyometrics. This empowering fitness craze focuses on transforming lives from the inside out! This class is level 2 but all levels are welcome! This class is approx. 60 minutes with upbeat and LOUD music (may contain explicit lyrics). A moderately paced, yet vigorous flow practice. Flow and Glow focuses on strength, stamina, flexibility, and concentration. Just as the name suggests, flow, balancing, spine strengthening, core strengthening and more! This practice will help tone and sculpt the entire body. VINYASA FIT’s signature practice! A consistent structured flow that will enhance your flexibility, strength, and stamina! In this class you will reduce stress while building muscle through our staple micro-pulse movements. All levels welcome (BEGINNERS – ADVANCED) however, we encourage you to go at you own pace and listen to your body. Inferno Hot Pilates is High Intensity Interval Training (HIIT) based on Pilates Principles. It is a heated, one hour class that is High Intensity, but Low Impact. This full body workout is designed to strengthen muscles, increase flexibility, and improve overall health. Experience fast, visible results and feel fantastic! Heated (POWER) vinyasa flow. V-FIT Incorporates light (OPTIONAL) hand weights, cardio and fun music! You will be working deep muscle groups while incorporating hot vinyasa flows to help strengthen your core, improve your balance and obtain the long and lean figure of your dreams! FIND THE CLASS THAT WORKS BEST FOR YOUR SCHEDULE.